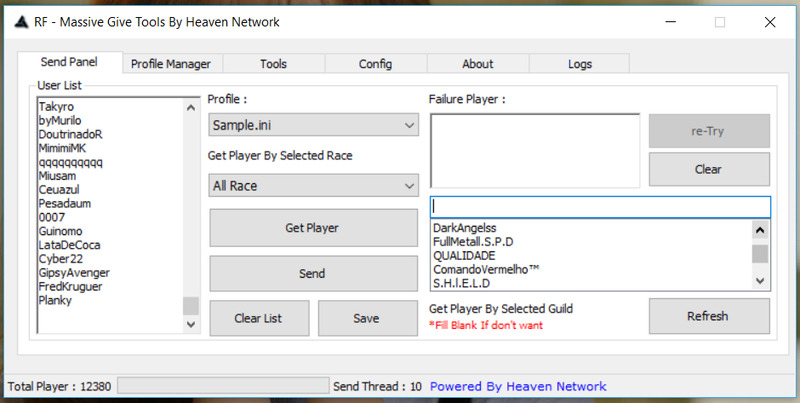 Welcome To Heaven Network ! We're Specializing For RF Games. Free Convert Server To Client !! RF Massive Give Tools, an easy tools to Send Rewards / Item. A Tools For Admin To Send Rewards to Players. By clicking the "Link" button, downloading or using the Application, you are agreeing to be bound by the terms and conditions of this Agreement. This Agreement is a legal agreement between you (either an individual or a single entity) and Listed Application and it governs your use of the Application made available to you by Heaven Network. If you do not agree to the terms of this Agreement, do not click on the "Link" button and do not download or use the Application. The Application is licensed, not sold, to you by Heaven Network for use strictly in accordance with the terms of this Agreement. Heaven Network grants you a revocable, non-exclusive, non-transferable, limited license to download, install and use the Application solely for your personal, non-commercial purposes strictly in accordance with the terms of this Agreement. This Agreement shall remain in effect until terminated by you or Heaven Network. Heaven Network may, in its sole discretion, at any time and for any or no reason, suspend or terminate this Agreement with or without prior notice. This Agreement will terminate immediately, without prior notice from Heaven Network, in the event that you fail to comply with any provision of this Agreement. You may also terminate this Agreement by deleting the Application and all copies thereof from your mobile device or from your computer. The Agreement constitutes the entire agreement between you and Heaven Network regarding your use of the Application and supersedes all prior and contemporaneous written or oral agreements between you and Heaven Network. You may be subject to additional terms and conditions that apply when you use or purchase other Heaven Network's services, which Heaven Network will provide to you at the time of such use or purchase.